Some innovative artists know the value in discarded metal, tools, trampoline frames & springs, bike & automobile parts and everyday items. They re-purpose such materials and create amazing works of art, some FUNctional, some purely decorative. These ingenious artists turn their ideas, or your commissions, into unique metal garden art in many styles and sizes. 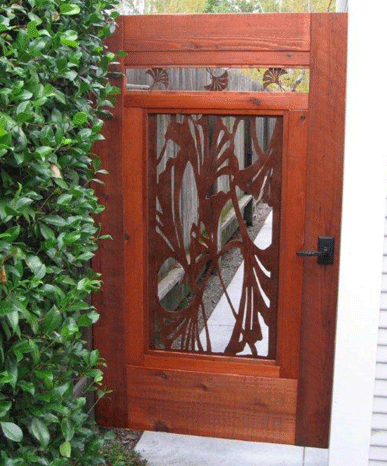 Gina Nash transforms recycled steel into artful panels for remarkable railings & garden gates (like the one shown above), fire pits, rain chains and porch lights. Tim Pace creates a wide range of animals, plants, wind catchers, benches, abstract sculptures and other recycled metal decor. Leo Razzi invents imaginative industrial art such as funky furniture, gates, window boxes and more. Hi I am so excited I found your weblog, I really found you by accident, while I was browsing on Digg for something else. Anyway, I am here now and would just like to say thanks a lot for a tremendous post and a all round enjoyable blog (I also love the theme/design), I don’t have time to look over it all at the moment but I have book-marked it and also added in your RSS feeds, so when I have time I will be back to read much more, Please do keep up the superb work.